In the latest annual survey conducted by the C.S. Mott Children's Hospital's National Poll on Children's Health, adults see obesity as the biggest health problem for children in their communities. Drug abuse is second, and smoking and tobacco use is third. This is the fourth year in a row that obesity, drug abuse, and smoking have topped the list of biggest health problems for children, as measured in the Poll. It is the third consecutive year that obesity has been rated by adults as the leading health problem facing kids in the United States. In May 2010, the Poll asked adults to rate 20 different health concerns for children living in their communities. 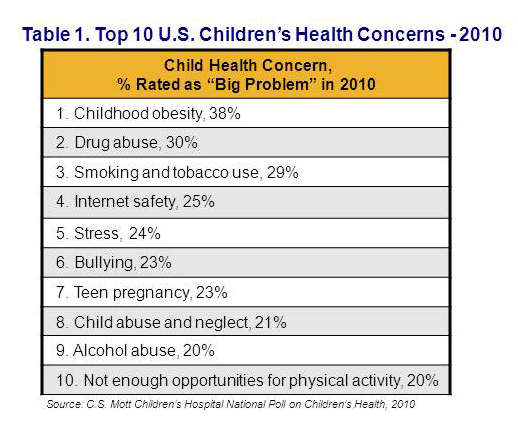 Table 1 presents the top 10 children‟s health concerns rated as a “big problem” by adults in 2010. Health concerns also rated as a big problem for children include: chemicals in the environment (18%), “sexting” (sending sexually explicit messages via electronic devices) (16%), depression (15%), sexually transmitted infections (15%), school violence (13%), asthma (10%), neighborhood safety (8%), autism (8%) and suicide (8%). Adults who rated health concerns as a “big problem” for children in their communities were asked to indicate whether those concerns are getting better, staying the same, or getting worse in the past year. More than half of adults (57%) who rate childhood obesity as a big problem for kids say it is “getting worse” (Figure 1). Similarly, half or more of adults say that stress (56%) and teen pregnancy (50%) are worsening health problems for children. Stress moved from 8th on the top 10 list in 2009, to 5th this year overall. Levels of stress among children may relate to economic hardship faced by their families during the ongoing recession. Stress faced by kids related to their families‟ economic challenges was addressed in the July 2009 Poll. Adults' ratings of the top health problems for children in their communities differed by race/ethnicity, as shown in Table 2. Whereas white adults rate childhood obesity as the #1 health problem for children, Hispanics rate it as #2 and black adults rate it #3. 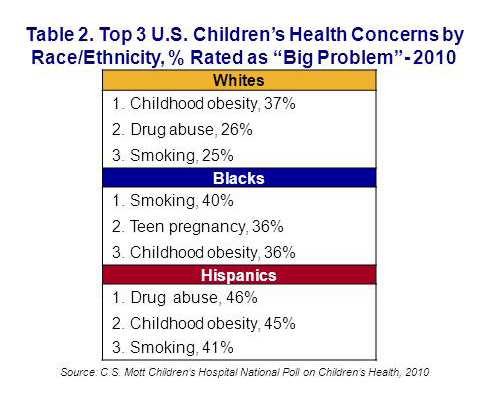 Meanwhile, smoking is rated the #1 health problem for children by blacks and drug abuse #1 by Hispanics. 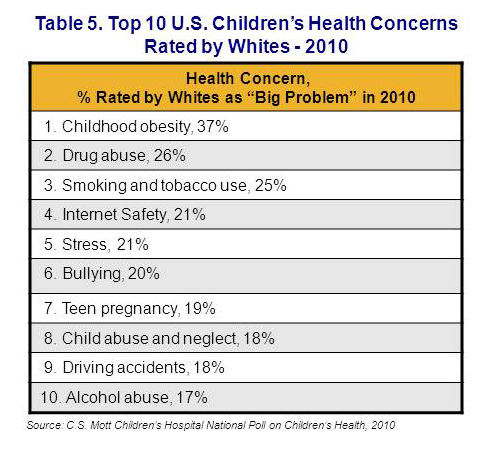 For the complete list of the top 10 child health concerns rated by Hispanics (Table 3), blacks (Table 4) and whites (Table 5), see page 3. For the 4th year in a row, black adults rate teen pregnancy as one of the top health problems for children in their communities—this year as #2, at the same level of concern as obesity and slightly lower than smoking. In comparison, teen pregnancy was rated #4 by Hispanic adults and #7 by white adults, see tables on page 3. Childhood obesity is rated by adults as the top health problem for children in their communities for the third year in row. 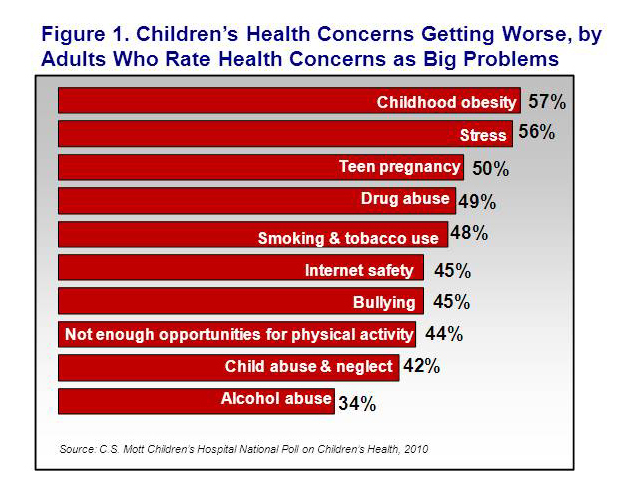 Most adults who rate childhood obesity, stress, & teen pregnancy as big problems for children say these problems are “getting worse”. 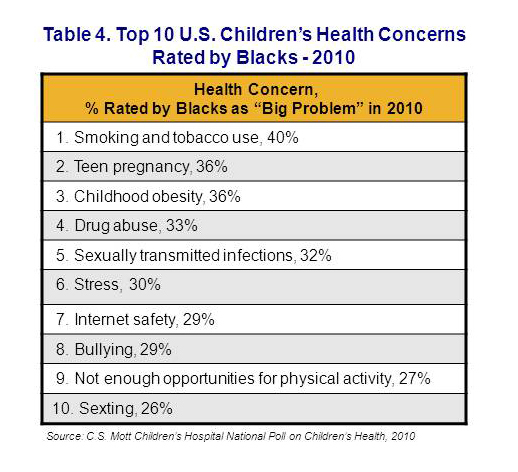 Among black adults, smoking is rated as the top health problem for children. 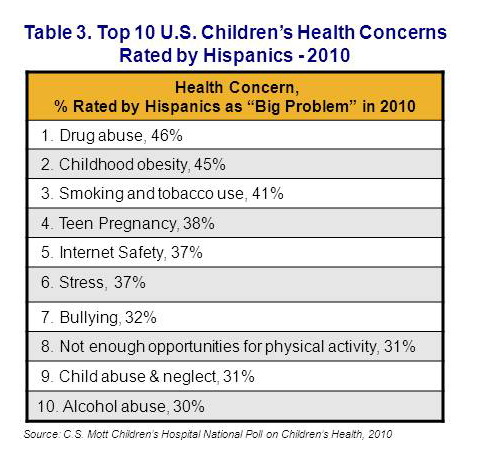 Among Hispanic adults, drug abuse is rated as the top health problem for children. Taking the public's "pulse" on child health issues can help set program priorities in medicine and public health, and can also help officials see whether messages about specific health risks for children are reaching the public. The results of this latest annual Poll on the biggest health problems for children suggest that public efforts to address childhood obesity (from Michelle Obama's initiatives to local community programs) should be well received. Adults see childhood obesity as a health problem bigger than any other for American kids today. That degree of concern has been consistent for 3 years, which likely reflects two issues. One issue is that public health messages about the health risks of obesity for children has been heard broadly—perhaps more than any other message—in recent years. The second issue is that the childhood obesity problem is not quickly remedied. In fact, findings in this Poll indicate that most adults who see childhood obesity as a big health problem for kids also believe that it is getting worse. This result runs slightly counter to the most recent national data on childhood obesity, which suggest that recent rises in rates of obesity have now begun to level off. However, those data (from 2008) may not reflect the latest patterns in communities in 2010. Moreover, increasing concern among adults may relate less to the prevalence of obesity and more to perceived risks of obesity-related health problems for kids. This Poll also shows that drug abuse and tobacco use remain of great concern, which may reflect the longer-term public health efforts to discourage substance use among youth and the clearly negative consequences of using these substances. In the currently challenging economic times that American families currently face, it is not surprising that stress is rising as a child health problem of concern. Nonetheless, while adults' concerns about making ends meet do receive lawmakers' attention, children's stress may "fly under the radar," and may require more dedicated policy efforts by child health advocates and closer attention from clinicians. This report presents findings from a nationally representative household survey conducted exclusively by Knowledge Networks, Inc, for C.S. Mott Children’s Hospital via a method used in many published studies. The survey was administered in May 2010 to a randomly selected, stratified group of adults aged 18 and older (n=2,064) from the Knowledge Networks standing panel that closely resembles the U.S. population. The sample was subsequently weighted to reflect population figures from the Census Bureau. The survey completion rate was 61% among panel members contacted to participate. The margin of sampling error is plus or minus 3 to 7 percentage points for the main analysis. For results based on subgroups, the margin of error is higher. Davis MM, Singer DC, Butchart AT, Clark SJ. Obesity, stress & teen pregnancy top child health problems – getting worse. C.S. Mott Children’s Hospital National Poll on Children’s Health, University of Michigan. Vol 10, Issue 3, August 2010. Available at: http://mottpoll.org/reports-surveys/obesity-stress-teen-pregnancy-top-child-health-problems-%E2%80%94-getting-worse.